In the past, I read that you should let your parsnips stay in the ground until after your first hard frost date. Apparently the frost makes them sweeter. In my case, I let them hang out until the first week in December, long past my first frost date. As I stood there near my parsnip patch, I pondered what I was doing wrong. I even tried to dig them out using my small trowel. Nada. Nothing. Zippo. Those parsnips were not coming out. How could this be? Aren’t parsnips just like carrots? Then I thought perhaps the parsnips did the spider dance like my carrots? Check out the above picture caused by my transplanting carrot seedlings. Yes, a real conversation piece. Finally exhausted from trying to pull out those darn plants, I went to my favorite Plan B. The husband. He loves to dig so I knew he would take on the challenge with “it’s a no sweat” attitude. Well those parsnips gave him a run for his money. He took a regular shovel and dug to China he thought. Finally, he came back into the house with 9 parsnips that looked like small trees. When I asked him how deep he had to dig, he replied, “deep.” Translated. A lot of work. He broke the side of the 3 by 3 raised bed which I was never particular fond of trying to get the ones close to the side out. I couldn’t help myself and took this picture of one of the parsnips. Doesn’t it look like the bottom of a woman? I started to hum the song, “These Boots Are Made for Walking” by Nancy Sinatra. (Don’t remember the song or want to reminisce, see here.) I know. I have my moments especially late at night when everything seems funny. So, readers, do you have any ideas why my parsnips look this this? 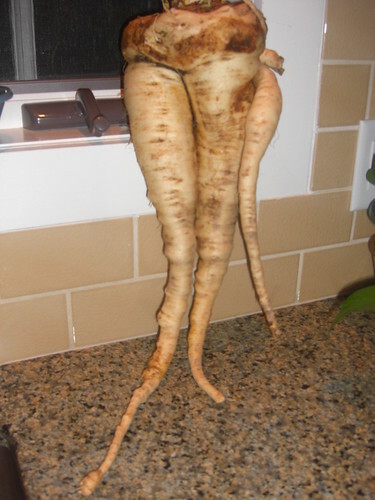 Have any good parsnip recipes? Any ideas what to do with the greens? Are they poisonous? I like them boiled with carrots and then mashed with butter, salt and pepper. Hubby likes them roasted. Tops go to the hens. Wow, what did you feed those things? It does look like female legs. 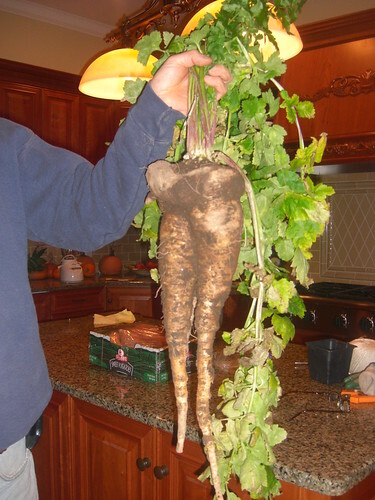 those parsnips have hips darlin and you are just TOOO funny anna !! .-= mother earth aka karen hanrahan´s last blog ..Seasonal Blessings And Joy! =-. I’m sorry, Anna, but if that looks like a woman, then it’s a women with either 3 legs or 2 legs and a tail. Is there something strange in your New Jersey water or something? Holy deformed root veg, Batman! .-= Beth Terry, aka Fake Plastic Fish´s last blog ..Plastic-Free Birthday =-. I like them boiled with carrots and then mashed with butter, salt and pepper. Hubby likes them roasted. Thanks 4 sharing this nice post.